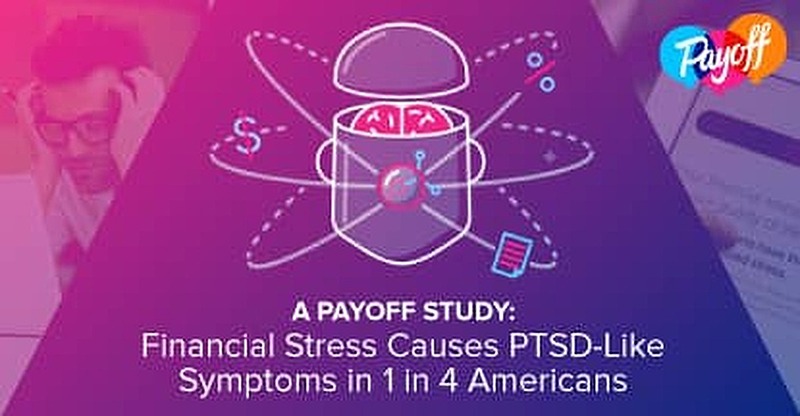 In a Nutshell: Payoff, a lender that blends psychology with finances, recently released a groundbreaking study that found a link between financial stress and Post-Traumatic Stress Disorder. A team of PhDs discovered that the symptoms of PTSD were indistinguishable from the symptoms of financial stress. Dr. Galen Buckwalter, Payoff’s Chief Science Officer, has dubbed this condition Acute Financial Stress (AFS). To identify and treat those with AFS, Payoff developed a six-question Financial Stress Test as well as a series of therapeutic emails coaching mindfulness and empowerment. Stress happens. As you go through your day, you inevitably come across conflict, difficulty, frustration, and it’s only natural to worry over it. Maybe you scream into a pillow. Maybe you eat an entire bag of potato chips in one sitting. People have their own way of coping and moving on from distressing situations. The danger comes when your stress takes over your life, warping your perceptions, distancing you from fulfilling relationships, giving you nightmares, and impeding your ability to enjoy life. That’s when stress becomes a serious mental health issue. A recent study has linked the stress that Americans feel about making ends meet to the stress felt by veterans coming back from combat. It may seem hyperbolic to say that your wallet is like a war zone, but, in terms of the psychological effects, Payoff scientists believe it’s not so different. Payoff is a lender that blends psychology with finances to issue loans and help customers understand how to use credit cards, pay down debt, and relieve financial stress. This BadCredit.org article details the revolutionary work being done by Payoff’s Empowerment Science team. Dr. Galen Buckwalter, Chief Science Officer at Payoff, has authored over 150 peer-reviewed articles. Taking a human approach to the financial sector, Payoff employs a team of scientists to gain insight into how people’s personalities, emotions, and behaviors impact their bank accounts. Heading up the research efforts of the Empowerment Science team is Galen Buckwalter, the Chief Science Officer at Payoff. Galen has a PhD in psychology and over 150 peer-reviewed articles to his name. In a survey of 2,011 American adults, the Empowerment Science team discovered that, for some people, worry over paying bills can be as debilitating as Post-Traumatic Stress Disorder. Payoff researchers call this condition Acute Financial Stress. Those with AFS experience nightmares, hypervigilance, avoidance, and other intense psychological symptoms. Financial stress has reached such a level that it is negatively impacting the thoughts, feelings, and behaviors of many people in the United States. Payoff’s research indicates that 23.2% of Americans, including 35.3% of Millennials (ages 22 to 29), suffer from AFS. When examining financial behavior from a psychological perspective, the Empowerment Science team expected behaviors to line up according to the five primary personality dimensions: openness, conscientiousness, extraversion, agreeableness, and neuroticism. This factor wasn’t expected, but it was significant. A deep-seated fear over not making ends meet, failing to pay off debts, becoming homeless, all had a marked effect on the brain. Galen describes how this dysfunction often exacerbated financial problems by promoting harmful behaviors based on denial, avoidance, or irrationality. Payoff’s Chief Science Officer was familiar with the symptoms his team was seeing. 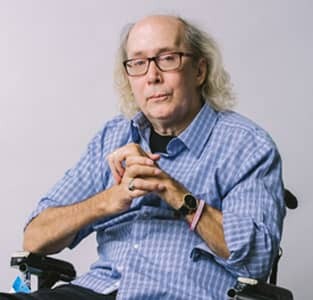 Prior to joining the financial lender, he worked at the Institute for Creative Technology, a think tank funded by the Department of Defense to blend academia with advanced technology. Galen’s main project was to teach soldiers to be resilient in the face of combat. He did so by using virtual reality technology that provided context for what the soldiers would be doing and seeing. Pulling from his experience with veterans, Payoff’s Chief Science Officer made a connection between PTSD and financial stress. The Empowerment Science team delved deeper to test out the theory that financial stress causes symptoms similar to PTSD. A survey went point by point through the PTSD Checklist, adapting the questions to ascertain if people felt extreme symptoms like hypervigilance and difficulty sleeping because of their finances. The answer was a resounding yes. In a non-representative survey on a crowdsourcing site, the results revealed that 40% of respondents fit the criteria for PTSD-related financial stress. This validated the team’s hypothesis and led to a study with a more representative sample of 2,011 Americans. Backed by psychological research, Payoff’s Financial Stress Test applies PTSD symptoms to financial stresses. Again, the results indicate a significant correspondence. Payoff estimates that nearly 1 in 4 Americans experience Acute Financial Stress, characterized by PTSD-like symptoms. The Empowerment Science team continues to be struck by the powerful impact that financial worry can have on a person’s thoughts, emotions, and behaviors. It’s a pervasive problem that’s largely overlooked in both the financial and psychological sector. Payoff’s findings have only just been announced, but they already have struck a chord with many individuals. Galen has heard dozens of stories from all quadrants about people who identify with the symptoms of Acute Financial Stress. He says the overall feedback has been that people resonate with the findings of the study. That in itself is a victory. AFS is characterized by symptoms such as irritability, guilt, difficulty concentrating, hypervigilance, avoidance, and emotional numbing. Quality of life relates to so much more than just your bank account, yet some people cannot seem to escape money concerns. People of certain ages, incomes, and personalities show elevated levels of AFS compared to average Americans. You can test yourself to see if you’re experiencing signs of AFS by taking Payoff’s online Financial Stress Test. Millennials, born between 1981 and 1997, represent a significant chunk of the U.S. population. Payoff’s study found that 35.3% of this young generation feels PTSD-related symptoms regarding their personal finances. This is above the average for that study. According to these findings, young people are experiencing more negative side effects due to financial strain. This could be because Millennials are just starting to establish themselves financially, possibly while burdened by student debt. It could be a generational difference in how people view money. Whatever the cause, what’s clear from Payoff’s research is that Millennials have a higher risk for financially-induced stress. Unsurprisingly, those living below the poverty line were more susceptible to Acute Financial Stress. High amounts of debt and low levels of income naturally lead to above-average stress. AFS isn’t necessarily rooted in reality, but rather by a psychological pressure that people feel to spend money as a way to achieve happiness. Galen finds this rationale problematic for a balanced life. He describes his own childhood as one with little financial means but much heartfelt contentment. Your personality type impacts how you react and view your finances. There’s much variation from individual to individual. However, it’s not all bad news for highly emotional individuals, because that very weakness is also a strength helping them to better understand and control their emotions. Galen says that, in general, more emotionally aware people respond better and faster to treatment. While some personalities are considered high-risk for Acute Financial Stress, others are relatively low-risk. The Chief Science Officer points to the financial personality called “The Rock” as being especially resistant to the symptoms of AFS. This personality type is noted for above average calmness, and so has a higher threshold of tolerance for stress. Payoff was not satisfied merely identifying the chronic issue, but immediately set out to treat it. Dr. Howes, Payoff’s resident Clinical Psychologist, was instrumental in developing a therapy program to help relieve financial stress. Payoff Peace offers emotional and psychological coaching, delivered right to your inbox. Anyone can submit their email address to subscribe to the Payoff Peace Email Series. This six-part series strives to provide clear instructions and techniques that will empower individuals to break old patterns of thinking and form healthier habits. It takes no more than 10 minutes to get through an exercise, sent every few days. These emails rely on simple audio recordings or worksheets. For example, recipients are directed to “Name it to Tame it” by journaling regularly about their stress. Payoff also gives step-by-step instructions for progressive muscle relaxation and negative thought replacement. While cognitive therapy won’t rid you of the root cause of the stress, it does help with the emotional fallout. Financial stress doesn’t need to be crippling, especially with the Empowerment Science team talking you through it. Payoff’s supportive email series aims to put you in a clearer state of mind, giving you the ability to confront your financial worries and start improving your behaviors simply by being aware and mindful. Taking that moment to center yourself is important to regain perspective and stay calm even in the face of conflict, loss, or turmoil. At this moment, millions of Americans could be feeling stress that goes way beyond normal, healthy levels. Acute Financial Stress is a condition that weakens a person’s overall ability to think and behave — and cannot always be dealt with alone. That’s the mission of the Empowerment Science team: to help others on the journey toward a healthy mind and balanced pocketbook. Conducting research in the field with its own members, the Payoff team is still learning, still striving to understand how finances impact a person’s state of mind.